Chinese actress, Fan Bing Bing (范冰冰) attended the QQ.COM Awards held at Narada Hotel in Sanya, China on January 12, 2012. The beautiful actress opted for a printed dress from D&G Fall/Winter 2011 collection, a plaited bun hairstyle to complete her look. 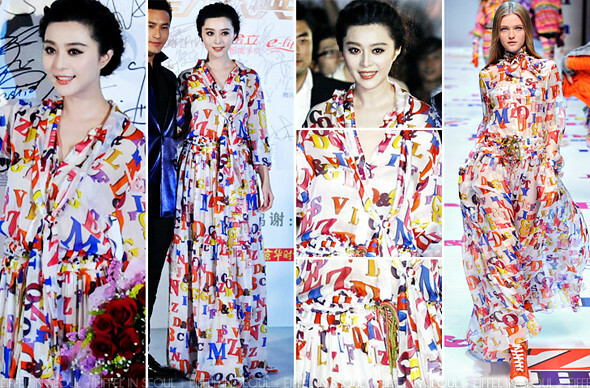 Seems like Fan Bing Bing (范冰冰) loves wearing chiffon long dresses. Check out her previous Bottega Veneta and Dolce & Gabbana looks. Love it or hate it?